Traditionally a nocturne is a musical piece, inspired by nighttime. 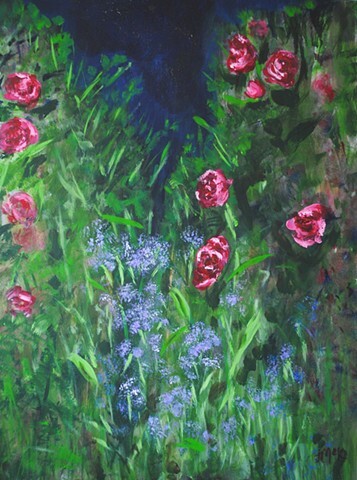 “Garden Nocturne” is named as such not only because it depicts the evening in the garden, but also because I imagine the sounds and music of nighttime in the garden. After dusk in the summertime, the outdoors really come alive. A summer garden at night is an entirely different world than a summer garden during the day. I imagine the birds and crickets and slugs and flowers all see the stars in the night sky and sing their praise upward.